Facial acupuncture is Chinese Medicine’s natural alternative to surgical face lifts and botox therapy. We believe in beauty from the inside out. Discover how Traditional Chinese Medicine can support you in looking your best. The Facial Rejuvenation Protocol seamlessly combines facial acupuncture, gua sha therapy, herbal infusion mask and facial massage for improved inner health and outer beauty. Both men and women can benefit from these treatments. 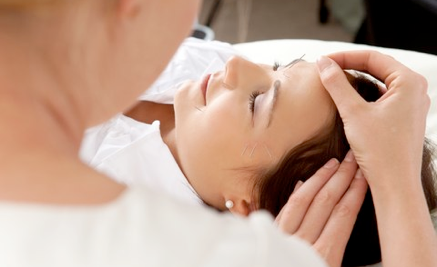 Acupuncture address imbalances in the body’s systems that may be manifesting in the face. Micro-needling targets fine lines, age spots, acne, acne scars, and other skin care concerns on the face. Patients report feeling more relaxed as if they have just returned from a vacation. Our signature treatment combines: Facial Acupuncture + Gua Sha Therapy + Facial Massage and Herbal Infusion mask for healthy-aging, fine lines, wrinkles, scarring, sun/age spots. 12 weekly treatments recommended for optimal results.